The Cheerleaders – Kara Thomas // This was such a good, easy read. Once I started it, I couldn’t put it down trying to figure out what happened and why – and I honestly didn’t see it coming. Plus the twist at the end – HOLY COW. It’s Always the Husband – Michele Campbell // Whoa, this book. I had recently heard about Michele Campbell through the last SUYB, so I thought I’d give it a read. I have to say, that this book will make you question what you think is going on so many times. I ended up being wrong about everything, but that’s what made me love the book even more. Will definitely read more of her. The Light We Lost – Jill Santopolo // This book tugged on absolutely every heart string in my body. A really beautiful story about an all-encompassing love that a woman just can’t shake. This book was so easy to read, and beautiful – I actually felt everything that the main character was feeling. So good. 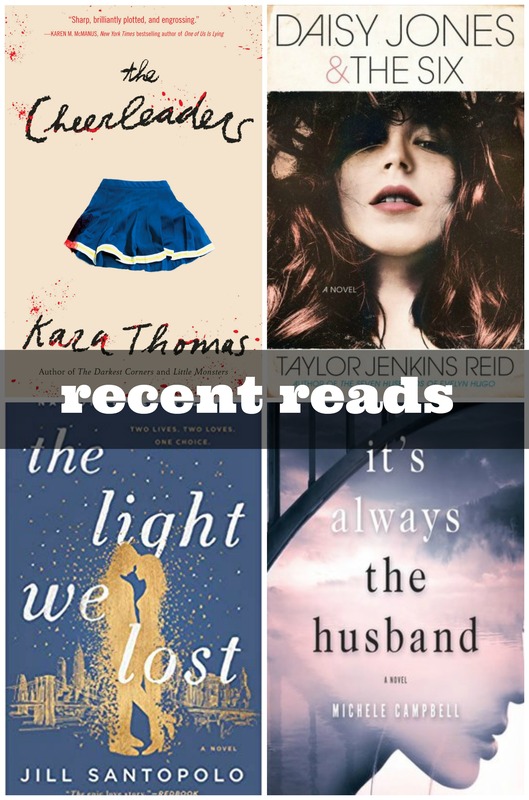 Daisy Jones & The Six – Taylor Jenkins Reid // I have heard good things about this book for forever, so I was so happy when my library bought it, and I was the first one on the wait list. I loved the format of this book, and just like Nadine said, it reads like a Behind The Music on VH1. It was so interesting to read a book made up of interviews with bandmates, and to get both sides of the story. If you haven’t picked this one up – definitely do it. TJR does it again. This weekend was so crazy busy! I feel like that is happening more and more lately as the weather is getting prettier and prettier. Friday night, B went out, so Sheffield and I just hung out, had some dinner an watched some TV. I finished up Dumplin’ on Netflix (love. they did the book justice on this one), and then for some reason felt like getting all up in my feelings, and turned on The Notebook, and of course just bawled my eyes out. Saturday morning, I took Sheffield down to Calera to see Thomas the Train for a little mommy/son date. He was so excited, and we actually had a really good time. 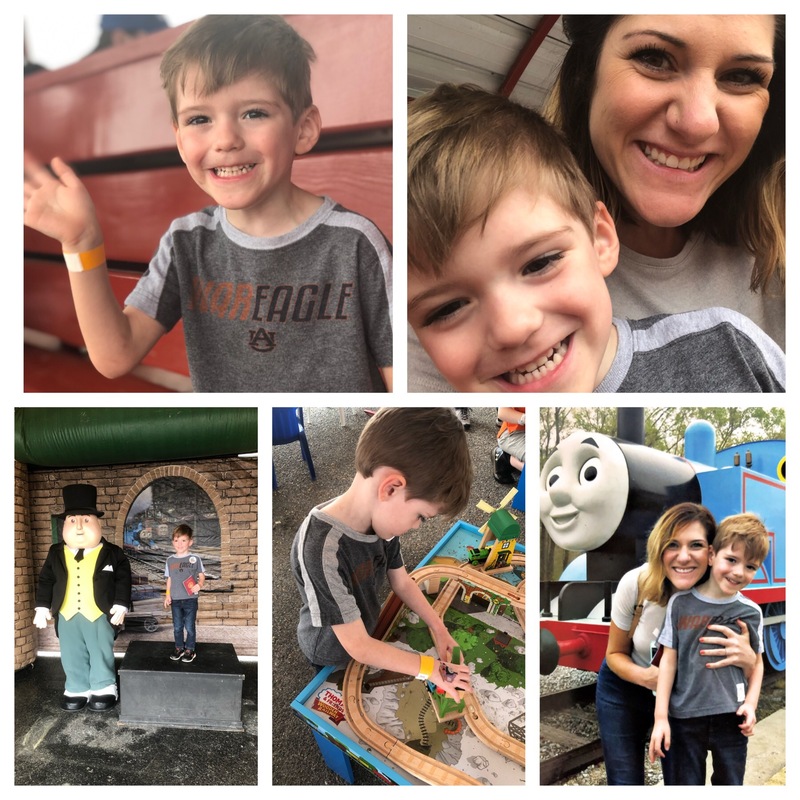 We rode Thomas, got a temporary tattoo, played with train sets, and saw Sir Topham Hat. I do love getting that one-on-one time with my babe. I’m hoping I can keep that up as he gets older – or as long as he’ll let me. Saturday afternoon, we met up with Robyn and her gang over at Back Forty for some lunch and brews. 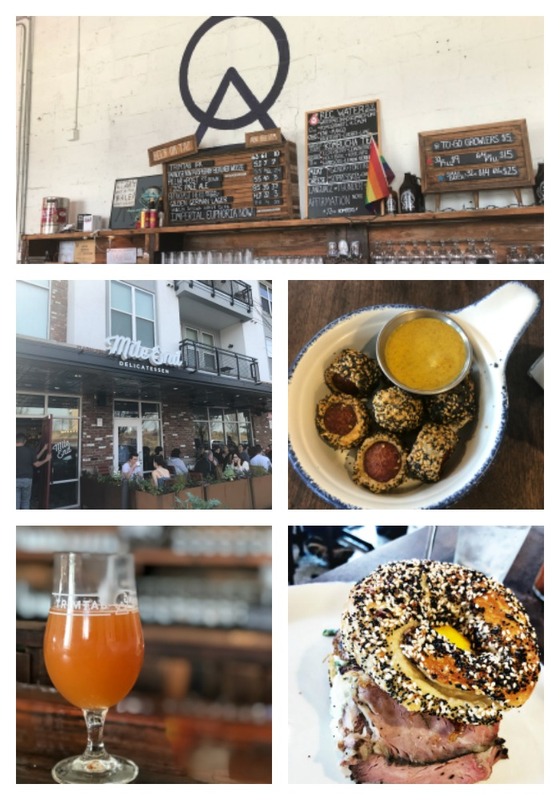 I had their amazing burger and fries, and tried their hazy double IPA, and it was so good. We also splurged and got their s’mores brownie thing, which was amazing. The weather was so pretty that we sat outside and let the boys run around – they were so cute together. 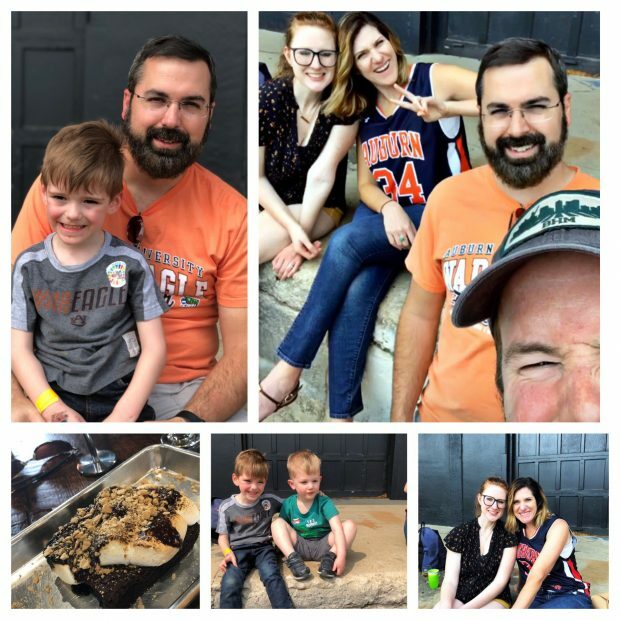 Saturday night we met up with some more friends to watch the AU Final Four game over at Crestwood Tavern. Unfortunately, it didn’t go our way, and we lost by one point. It was still a ton of fun, though!! There are a few pictures, but I don’t wish to share those horrible things right here. 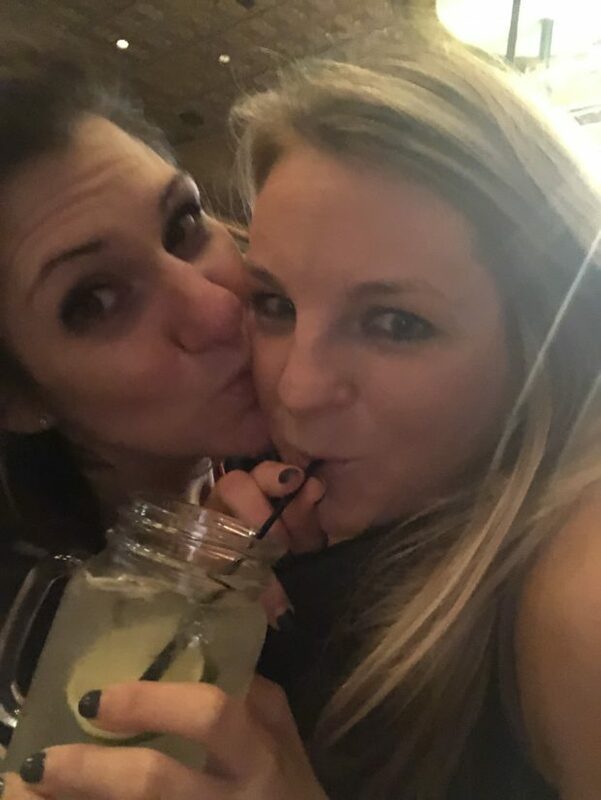 After that, I met up with Cara for her birthday celebration in Uptown. We weren’t there too long, since we had to go home to relieve our Wyndy babysitter (more on this experience later!!). B made us some pasta, we ate it in bed and called it a night. Sunday morning I met up with my sister for brunch over at Skycastle. 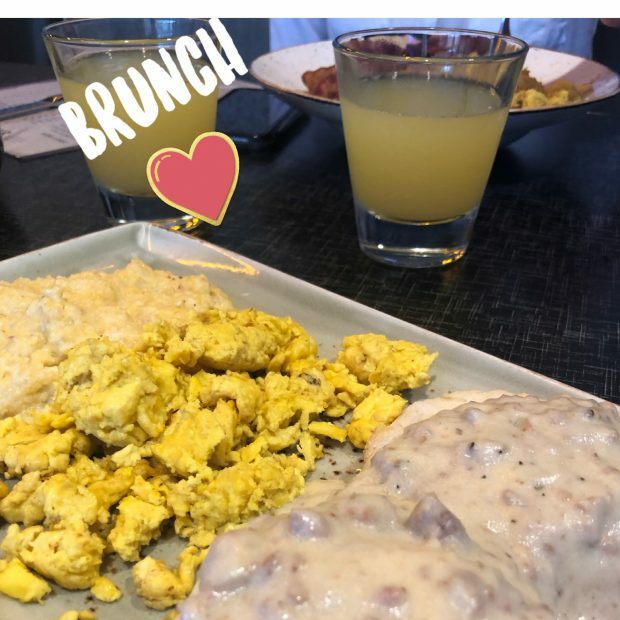 It wasn’t my favorite brunch, but they did have a $15 pitcher of mimosas, where they give you the entire bottle of champagne, so it wasn’t all too terrible! After brunching, we did a little shopping, and then went home to beat saber and have a few more drinks with the boys. It was a pretty exhausting weekend, but tons of fun. I don’t plan on watching the National Championship tonight in protest, so hopefully I can get an early bed time in tonight. So if you’re not into sports, you’ve heard by now that my alma mater, Auburn University, has made it to the Final Four for the first time EVER. But before they got there, they had to make it through the Sweet Sixteen in KC that I got to go to!!! We drove over to my dad’s house in Kansas City. Sheffield got to enjoy some time with his grandparents, drank a lot of wine, ate a pizza from Minksy’s that had Joe’s KC BBQ on it (and it was amazing! ), ate BBQ from Blind Box BBQ, and then finally on Friday night, we went to the Sprint Center to watch AU take on UNC. 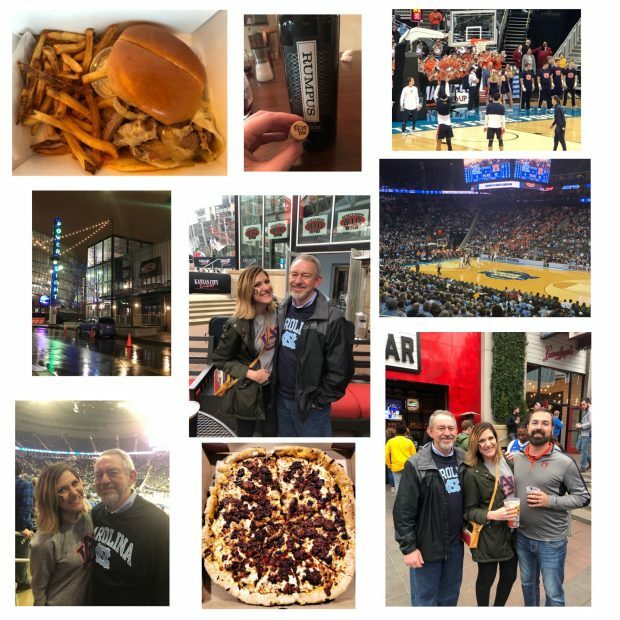 We went down to the Power & Light District for some beers and Fireball and pep rally fun. Then AU somehow pulled out the win! It was a once in a lifetime experience, and I’m glad I got to experience it. It was really a lot of fun, and was grateful to see my Auburn boys in person! Hopefully you’ll be cheering them on in the Final Four and then hopefully onto the National Championship! For as long as I can remember, I have been obsessed with my weight. It is something that is constantly on my mind – something that I can’t seem to shake out of my mind. I wish I could – I wish that I could walk around with all that “body confidence” that’s all the rage these days. I think it started for me in high school. If I were to show you a picture of myself from then, I was pretty heavy. And I hate to admit this, but I’m pretty sure the obsession started when a boy that I had a huge crush on called me a “fat dog.” Yes ladies and gentlemen, the bullying was real. And it hurt. I can’t even tell you how many times I cried or how much time I spent pinching my stomach or looking in the mirror telling myself how ugly and fat I was. It was exhausting. I had never thought of myself as those things until that boy had said them to me – and then all of a sudden it became real in my brain. If someone was comfortable enough to call me that, then it must be so. High school mentality and all. So instead of doing it the healthy way with diet and exercise – I starved myself. I took diet pills. I would eat tomatoes and a handful of popcorn from work at the movie theater and call it a day. I took diet pills so many times that I would have to rush out to the bathroom because of a really bad bloody nose. The diet pills had shot my blood pressure up so high – they made me feel jittery and nauseous and dizzy all at the same time. And I lost the weight, of course I did. Eating less than 500 calories a day will do that. And that was the restriction I put on myself. Sadly, this obsession followed me to college. I worked out twice a day – once in the morning, once after classes were done for the day. I was done with the diet pills, because I just couldn’t risk having a catastrophic nose bleed in class. But I wasn’t done with starving myself. I would eat dinner, and that was all, and even that may have been a turkey sandwich or a package of Easy Mac. I taught myself how to ignore the hunger – and soon, I just wasn’t hungry. I was consumed by this image of a perfect body – regardless of what I was actually doing to my body. I wanted people (mostly boys) to look at me, and be like, damn. At my lowest weight, I weighed 125 pounds. On a 5’8″ frame, I looked like a skeleton. There’s a picture of me from a sorority formal that I actually cringe looking at. You can see bones protruding everywhere – to look at it today terrifies me. I have come far from those days – however, not from the days of constantly worrying about my weight and what food goes in my body. It’s exhausting. So exhausting. I no longer starve myself, and I work out a healthy amount. 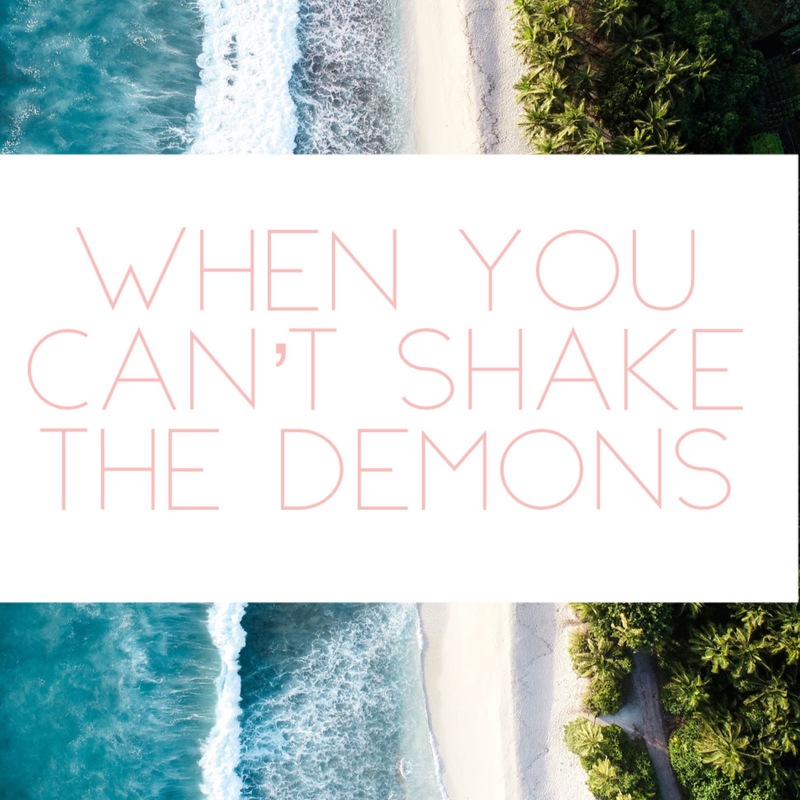 However, there’s always that little demon that I carry around telling me I’m no good, because I’m not a size 4, and you can’t see my hip bones. I’ve talked to people about this – I know that it’s not healthy, and I want to get better. However, that’s always easier said than done. Having good friends and a good husband who tell me that I’m perfect the way I am helps a lot. I’m not sure where I would be now if I didn’t have them. They didn’t tell me that I was crazy – they listened to me and asked me what they could do for help. If I said, please make sure that I eat breakfast, or please make sure that I am not shoveling diet pills into my mouth – that’s how they would help. It is hard to write about this – but also feels really good to just put it all down. I wish that it was something that you could just “cure,” and be done with it, but it just isn’t that easy. I’m working on it – I am. If you’ve made it this far, thank you for taking the time to read something that is so personal and raw. This weekend was one of those that makes me yearn for the weekends. The weather was absolutely gorgeous, and Sheffield was so well-behaved, and we got some wife/husband time – and it was just good. 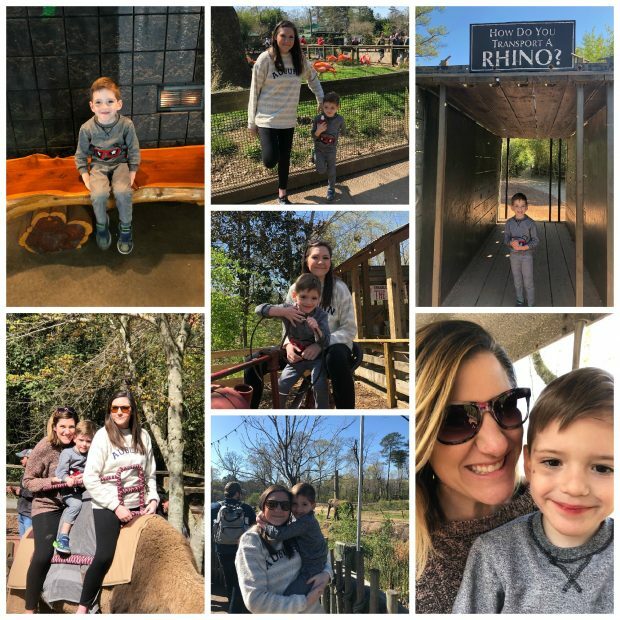 Saturday, we woke up, convinced Aunt Juney to come to the zoo with us, and it was just a super fun trip. We saw all the animals, rode a camel (and let me just say how proud of my kid I was – he was so afraid to do it, he did it anyway, and ended up loving it), fed an elephant, rode the train, and then went to lunch. We ended the night watching AU win their way into a Sweet 16 appearance, and then called it a night. It was such a good Saturday filled with zoo fun, aunt Juney lovins, and AU being freaking amazing. Y’all! We beat KU by 14 points!! Sunday my sister and her boo came to take Sheffield bouncing so B and I could have a fun morning date. We finally got to hit up Mile End Deli by Railroad Park, and I wear that Steak’n’Egg bagel was one of the best things I’ve ever put in my mouth. We followed that by going to TrimTab to have a beer – where we played Trivial Pursuit and tried their Euphoria Now and Double Helix IPA (which was AMAZING!). So thankful to my sister for allowing us to be able to do that. This weekend was a good one – Sheffield was so good. And since that is a rare occurrence lately, I’ll take it. Also, that bagel. I can’t stop thinking about it – going to need more of those in my life.